We stock up on all these items in case of emergency events like the latest ice storm. Fortunately, we were without power for only three hours. Other Georgians didn’t fare as well. Our Plan-B cooking methods were in place but were never called into action. Today, cabin fever struck. I needed some back yard dirt time. What to do??? 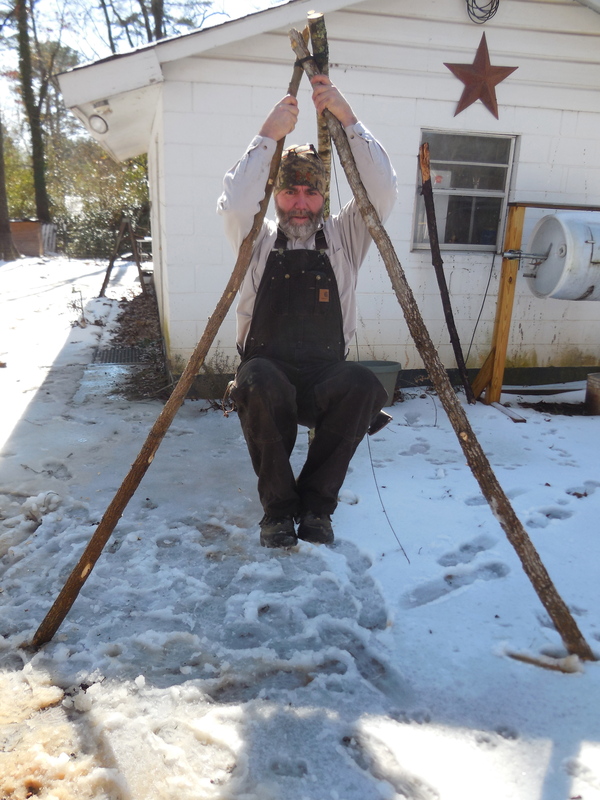 I know… make a tripod for our fire pit! The first two emergency cooking fuels on my list are non-renewable. I’m sure I could make lump charcoal but not something I’ve done before. I don’t count on a method until I’ve practiced it. Always trading theory for ACTION! Firewood is plentiful and gives us one more cooking option. 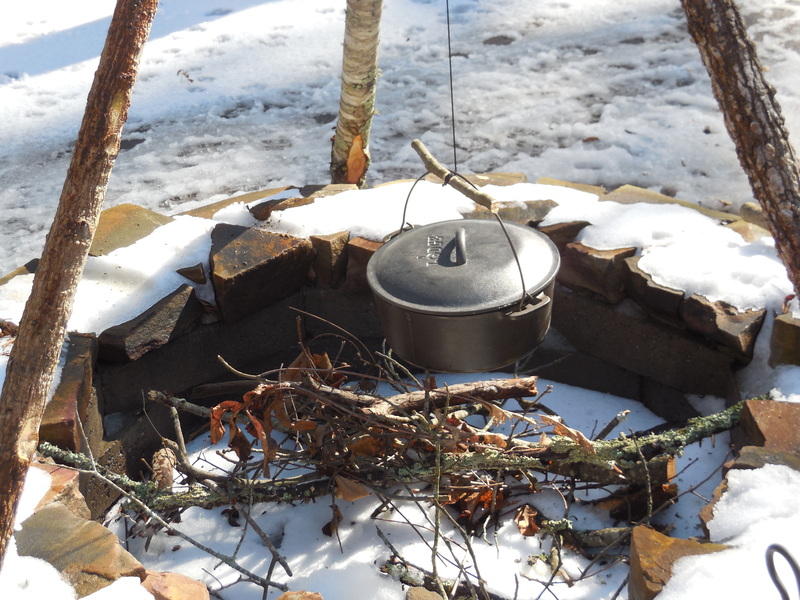 Now I needed to build cooking equipment for our primitive outdoor kitchen. Cut the three saplings and trim branches. The base of my trees were about forearm-size with the tops about wrist size. Don’t discard the branches. You’ll use these resources later in your build. Lay the saplings side by side. 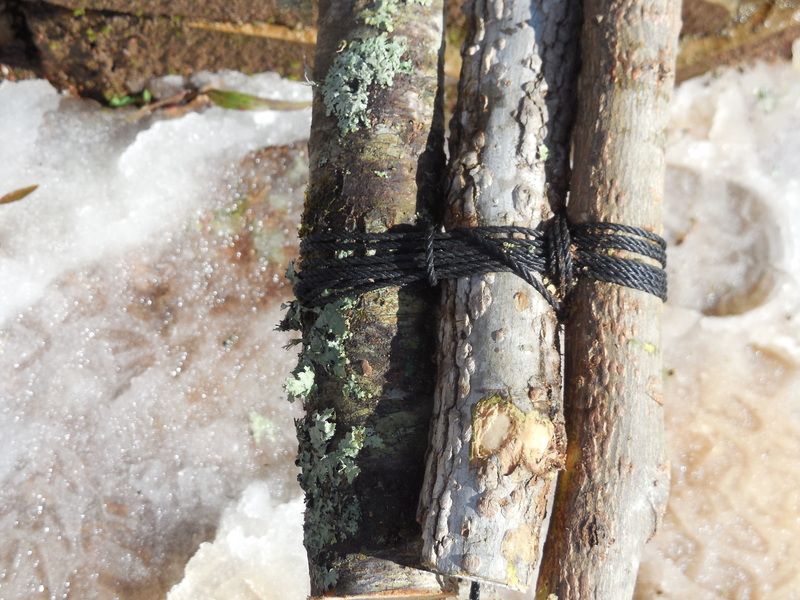 Tie a Timber Hitch with bank line onto the end of one of your poles. Here’s an animation for a tying a Timber Hitch. For this application, skip the half hitches if you’re using tarred bank line. Fold over a 4 inch tag and twist the loop several times. 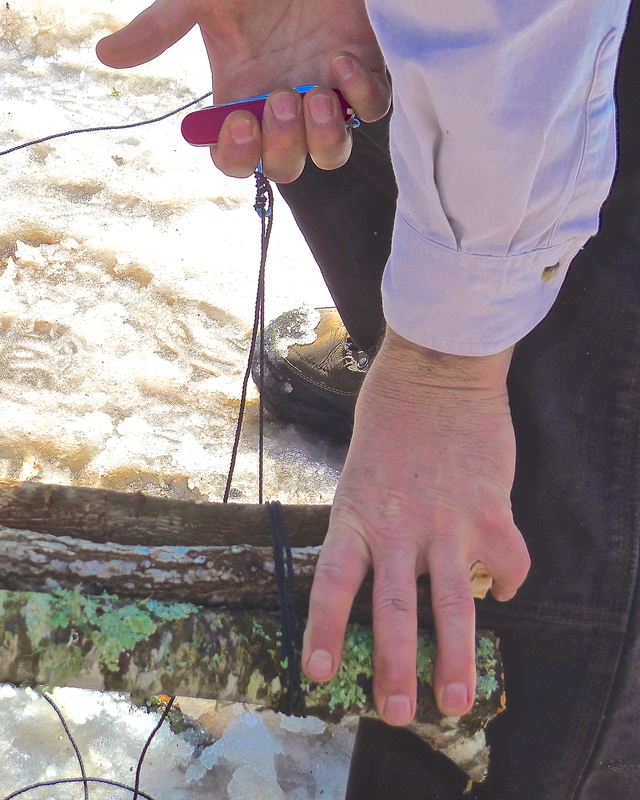 Then pull the long tag line through the loop and cinch it tight about 5 or 6 inches from the top of one of your poles. With poles laid flat, wrap three revolutions of cordage securing two saplings. Use a stick, screw driver, or attachment on your Swiss Army Knife to pull the loops tight. Now make three more passes and pull tight again. Keep the cord as tight as possible while keeping the poles side by side – don’t allow them to bunch together. 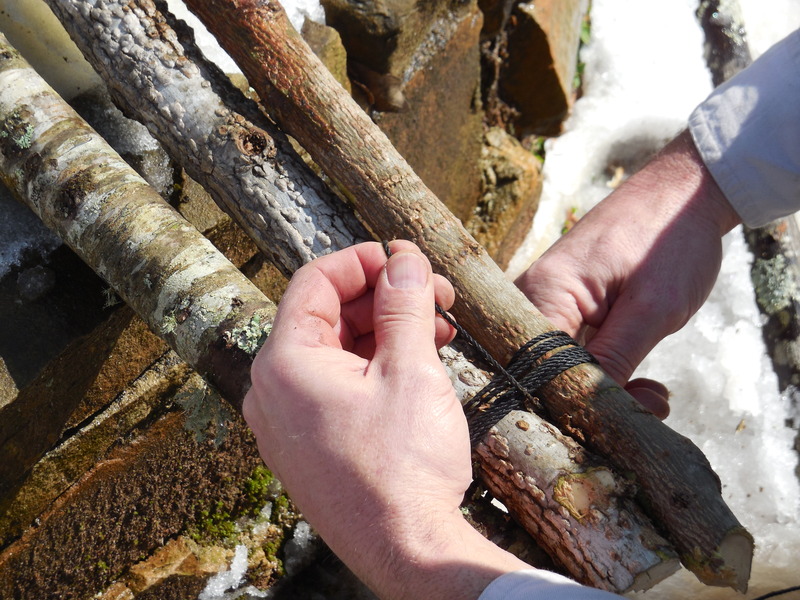 Next, thread the cordage between the first and second pole below the previous six wraps. These wraps are called frapping. Pull the cord up and over the top of the six cord warps. Repeat this until you have three revolutions around the six strands running perpendicular to your poles. Tighten your cord every third wrap. You now have six wraps running horizontally with the poles. Tie off the tag on the sixth wrap with a half hitch. Spread the poles out and set up over your fire pit. Mark where the ends meet the ground and fold your tripod back up. Place the poles on a wood anvil and trim the ends to a point for a better bite. 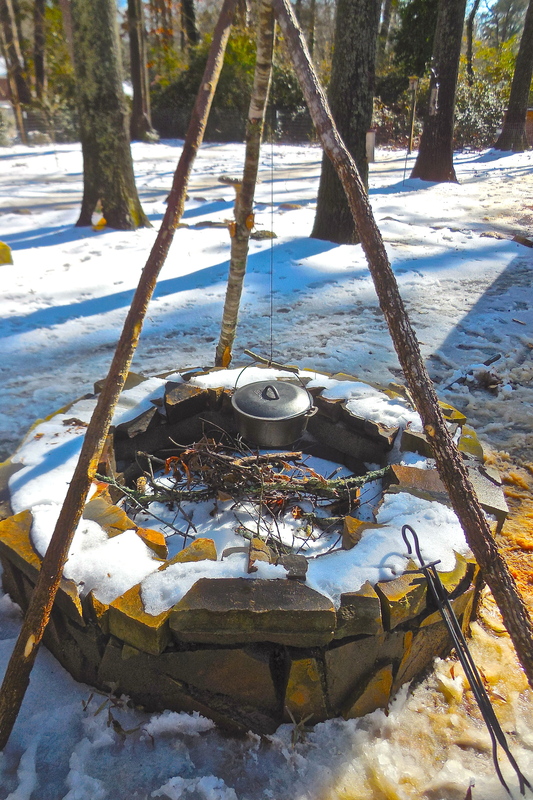 Re-install the tripod around your fire pit. You should have a long tag of cordage dangling down the center of the tripod. 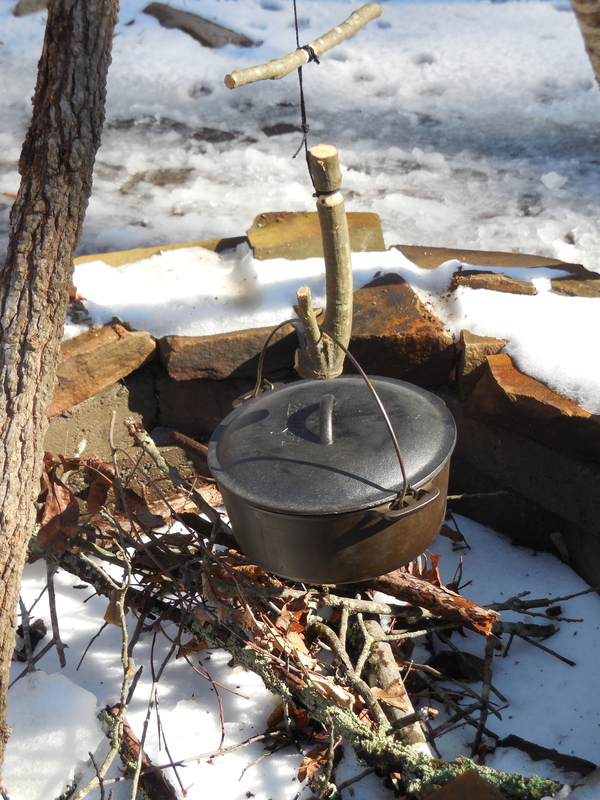 Use this to hang cooking pots over the fire. If you don’t feel #36 bank line is sufficient, you could use a metal cable or small chain. 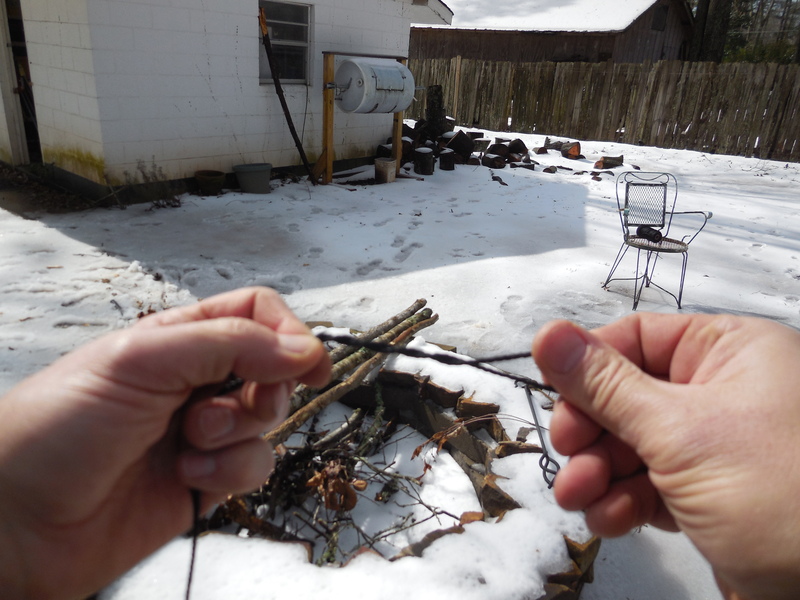 Make a toggle out of one of the limbs from your sapling. I made mine about 8 inches long. Cut a notch in the middle and secure the bank line in the notch. Slip the toggle through the wire handle to suspend the pot. You can adjust the pot height by looping the cordage over a pole stub at the top of the tripod. I also made a hook for the toggle system. Notch the top of the hook safely with a knife and tie a 12 inch piece of line around the notch. Tie a loop in the long tag end for your toggle stick to go through. This hook will allow you lower the pot close to the fire keeping the bank line farther away from the heat. Check out other pot hook options in one of our other articles. This set up is simple, sturdy, and functional. 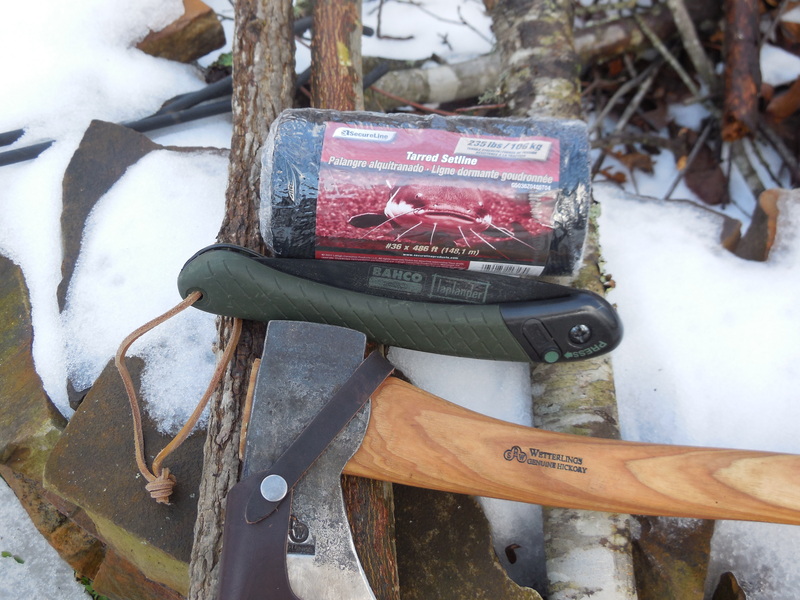 If the power goes out for a while, wrap your tripod in a tarp or canvas drop cloth to smoke the thawing meat in your freezer. Just a thought. Only thing missing is a few squirrels. Great tutorial, brother! Nice stuff you got here. Thank you, Dom! Just subbed to your YT channel. Been thinking of starting a channel myself. I think a lot of the tutorials would be best taught via video. BTW, enjoyed your flint and steel vid! Very nicely done and informative. Thanks, Sarah! Glad you found it useful! Let us know how it works for you.